Acute inflammation is your body’s natural immune response to tissue damage. When you fall down and cut your knee, the cut swells, reddens become inflamed. These are all good signs that your immune system is busy at work sending white blood cells to the site of your injury to repair the tissue. In this situation, inflammation is an essential part of the healing process. Occasionally we need to reduce it slightly, but it is our friend—we couldn’t live without it. Alternatively when we are sick and get a fever, the fever is inflammation, our bodies way to kill the virus and get us better. Chronic inflammation is however not helpful, it’s your body’s damaging immune response to a barrage of environmental, physical and mental invaders, which come in the form of things like poor diet, toxic chemicals, poor sleep, medications and stress. It is the type of inflammation you need to get under control in order to be healthy. Over time, chronic inflammation wears out your immune system, which may lead to chronic diseases and other health issues, including cancer, asthma, autoimmune diseases, allergies, irritable bowel syndrome, arthritis, chronic musculoskeletal pain and premature aging. Unfortunately medicine founded in treating the symptoms rather than the root cause of the problem, will ultimately not help. However there are plenty of simple practices you can incorporate into your daily life to fight chronic inflammation. Here are my top anti-inflammatory tips to get you started. 1. Eat more whole, plant-based, nutrient-dense foods. Leave out the foods that cause inflammation (sugar, processed junk food, chemicals and pesticides, grain based carbohydrates, dairy, corn, soy, alcohol and all foods you are sensitive or allergic too) and eat real food! Beautiful dark leafy greens, fresh veggies by the ton, raw nuts, berries, olive and flax oil, hemp seeds, clean meats, healthy fats). Eating them on a regular basis will flood your body with the vitamins, minerals, cancer-fighting phytochemicals, antioxidants, fiber and other goodies it needs to recover from chronic inflammation. Eating organic can be more expensive, so check out the Environmental Working Groups Dirty Dozen list https://www.ewg.org/foodnews/dirty-dozen.php which will help you prioritize which produce to buy organic (and when it’s OK to go with conventional). Then, as for non-toxic personal care products, EWG also has you covered with their extensive Skin Deep database. Oh, and don’t forget to stay hydrated. Proper hydration helps decrease inflammation, improves your skin and helps you flush toxins. Your gut holds approximately 60-70 percent of your immune system, so it’s a great place to start if you want to reduce chronic inflammation. And if your gut is in bad shape, your immune system might be in some serious trouble. One easy way to start improving your gut health is by adding a high quality digestive enzyme and probiotic to your daily routine. If you’re experiencing prolonged bloating, gas or other digestive discomforts, you most likely have a food sensitivity that you are not aware of. Pay attention to which foods bother your gut and don’t eat them for a couple of weeks and see if you feel better. 3. Relax & Rest and Make Sleep a Priority. It is common knowledge that we should be getting 7-8 hours of sleep per night. If you’re cutting corners with your sleep, you’re cheating your immune and repair system, which means it needs to kick into high gear in an effort to keep you well and your body repaired. Prioritize developing a sleep schedule, and then follow it closely. Sleep is the time when your body is able to heal from the physical and emotional traumas of the day. Interrupted, poor quality sleep cuts sharply into that healing time. I have found sticking with a sleep routine even on the weekends is helpful. For example I go to bed at 9:30 or 10 pm and get up at 6am. Although it is tempting to stay up late and sleep in on the weekends, this will mess up my sleep patterns. Basic sleep hygiene is also essential. Keep the room cool, dark and comfortable. Remove the television and phone from the bedroom, and allow yourself time to settle down and just be still. Don’t watch TV right up to bedtime. Give yourself an hour without screens before bed. Eating right up to bedtime is also not helpful. Drink water or herbal tea instead. Alcohol is also a stimulate, plus high in sugar, so is not helpful before bed. If you are having serious trouble sleeping, consider seeing a Naturopath for help managing your cortisol levels, blood sugar and ensuring your adrenals are functioning properly. Last, did you know that rest and relaxation actually makes us more productive? Studies have show that if we are always “doing stuff” and “busy” we cannot access the creative part of our brains which we need to be working if we are ever going to get ahead. Who knew we had to slow down to get ahead? Stress is pervasive in our culture. Chronic stress increases our cortisol levels which in turn increases inflammation. The more stress in your life, the more likely it is you’re headed towards an inflamed state. Consider starting a meditation program, getting more fresh air, exercising daily and journaling — all help release stress. Remember, you don’t have to make all of these changes at once. Pick one to get started and once it becomes part of your routine, choose another to add. 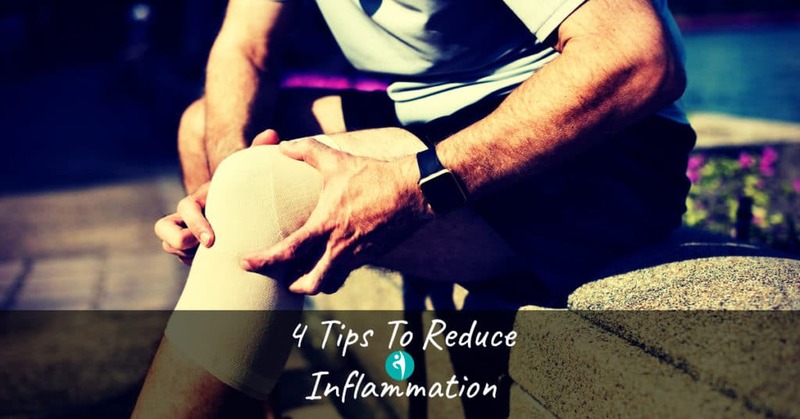 In today’s world, it’s essential that we all try to create an anti-inflammatory lifestyle to feel better now and protect ourselves in the long run. I have found that a morning routine of spending time creating my day through journaling and a brief 1-5 minute meditation session have really helped me. I also think it is important to get the right amount of exercise for your body. I was exercising too much and feeling sore and exhausted all the time because my cortisol levels were actually elevated because my body was breaking down. I had to find a middle ground with exercise, one that involves fresh air. This helped me a great deal. I also think it is important to learn to let go. We worry so about things that are beyond our control. Take a step back and let some stuff go, it will help you feel better.